So you know how they say you should do something every day that scares you? Well I’m doing just that. I’m pushing myself out of my comfort zone, I’m talking life by the horns, I’m carpe diem-ing. I’m growing plants from seeds. I know, it’s crazy. What am I thinking? How radical! How dangerous! It’s practically just plain irresponsible of me. In the past I have tried to grow things from seed and have been sadly disappointed by the results. I think that birds or animals have just plain eaten the seeds out the the ground which is why growing them indoors seems like the right plan. 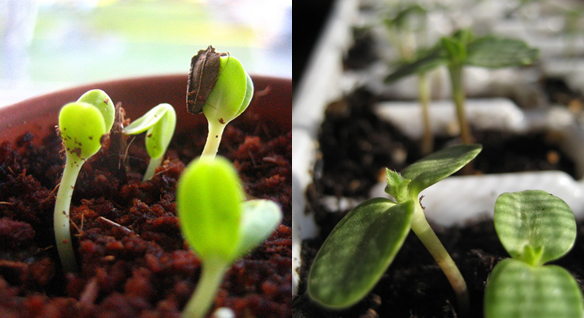 I planted 2 little pots of sunflower seeds in an attempt at my great white whale of gardening, and they are sprouting too, which is very encouraging. Twice I’ve planted sunflower seeds only to be greeted by crushing disappointment. Not this time, Sunflowers. Not this time. Apparently at some point I’ll have to “harden them off” which sounds unpleasant and a bit daunting. Practically every time I read about how I’m supposed to make these sprouts grow into real plants it seems a bit hopeless: will they have enough light? Are they in the right soil? Is the temperature right? Too much water or not enough? How do I transplant them successfully? When? Well I guess with all great gardening experiments all I can do is the best I can: plant them green side up and keep my fingers crossed. With any luck I’ll be bringing you all bunches of fresh herbs by early summer!